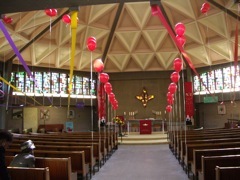 A welcome to St. Laurence’s is a welcome to a large and diverse Christian family. St. Laurence’s is a church rooted in the local community with good resources to serve the needs of our diverse neighbourhood. We have a valued music tradition and a catholic spirituality that is a challenge to Christian growth. Over the last one hundred and thirty years since our parish was founded, many changes have taken place in our church community. In our church life today you will find a wide section of the community united in worship and service. Our diversity enriches our parish family and broadens our understanding of God and of the mission of the church today. 10am: Sung Eucharist. Choir, hymns, sermon, creche, junior church and refreshments afterwards. 6pm: most Sundays, simple evening prayer – a half-hour service to end the day and to begin the week peacefully. Often on the first Sunday of the month, solemn choral evensong sung by the church choir. There is a said mass most days. On Wednesday, the 10.30am eucharist is followed by refreshments and often by social events. We have regular healing masses with laying on of hands and anointing for those who desire. Baptisms take place at the main eucharist approximately every six weeks. To arrange a baptism, talk to the priest after a Sunday morning service. Weddings: to arrange a wedding, calling of banns, etc, please ring the parish office (020) 8698 9706, or call by on a Thursday evening at 6.30pm. Confession: by arrangement with one of the clergy. Mothers Union meet on the first Tuesday of the month. This parish has formally adopted the House of Bishops’ ‘Promoting a Safer Church’ safeguarding policy statement.